Founders are wearing rose-colored glasses and eying Wall Street. 17% of entrepreneurs said their long-term goal is to IPO, according to Silicon Valley Bank's Startup Outlook report released Thursday. The report surveyed more than 900 tech and life science startup execs. It's the first time that Silicon Valley Bank has asked about plans to go public in its annual report. The majority of the startups surveyed (56%) said they expected to be acquired; 19% said "stay private," and 8% said they didn't know. "If [more had] said their goal was to IPO, I would say they are even more blindly optimistic than I thought," said Greg Becker, Silicon Valley Bank's CEO and president. It's important to note that the survey was conducted in December 2015. January saw complete silence on the IPO front, a first since September 2011. "They say timing is everything, and in the past several weeks it has become apparent that entrepreneurs' perceptions at the end of 2015 had already shifted by mid-January," Becker wrote in a letter announcing the results. He added that many are predicting "doom and gloom," including the death of some unicorns -- the term for private companies worth $1 billion or more. But he's more optimistic, noting that a "healthy recalibration" would be a good for the ecosystem. "[Entrepreneurs] are anticipating a more balanced funding environment," he wrote in the letter. "They are considering M&A an even more viable exit strategy." 2015 was the biggest year on record for technology mergers and acquisitions, according to Dealogic. Many of those surveyed said they expect the acquisition market to be even greater in 2016. Tech IPOs in the U.S., on the other hand, were at the lowest level since 2009. 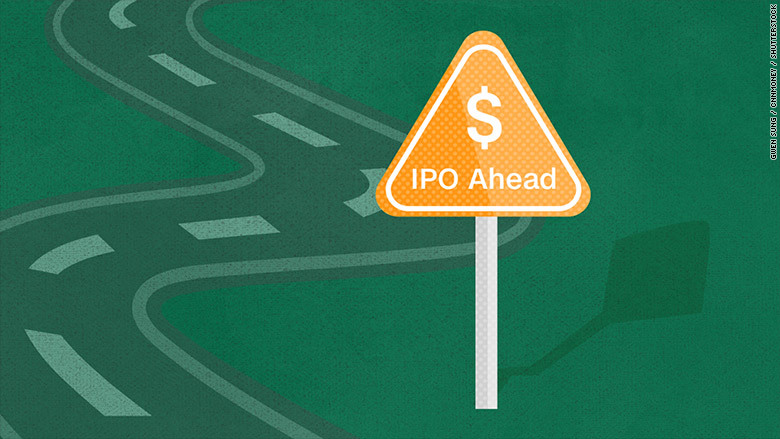 Analysts and investors say the IPO question is a tricky one. Entrepreneurs don't want to appear to lack ambition about how far they can take their company. An IPO can signal that they're dreaming big because the public market is the only means of outsized rewards. Anand Sanwal, cofounder and CEO of CB Insights, said "entrepreneurs are inherently optimistic," adding that most companies don't "choose" their exit. A very small minority -- likely less than 1% -- will go public. "You're building the company to be standalone," Maha Ibrahim, general partner at Canaan Partners, told CNNMoney, adding that she tries to discuss exit possibilities with founders early. "The hope is that you're bought, not sold." Becker says many startups have started decreasing their burn rates and focusing more on profitability, "which extends their decision making for going public or being sold." Sanwal predicts that the last two quarters of this year will be telling. By that time, many unicorn companies will need to have raised capital before their current supply of funding runs out. If they're able to raise -- and at what valuation -- will be telling. Of those surveyed, 42% plan to rely on venture capital money as their next source of funding. But they know that money could be hard to come by: 82% said the fundraising environment is challenging. And funding isn't the only thing that's scarce these days. 95% of those surveyed said finding the right talent -- specifically engineers -- is difficult. That's up 8% since 2013. The execs said it's the biggest issue facing startups, ahead of cybersecurity and healthcare costs.